In the background of this sign, you can read another sign: "Sydenham Sweet Bakery." On one of the main streets of Sydenham. Signs (looking north) at Brook Junction. To the left is the Ridge Trail. Cross Rutledge Road onto Mill Street and head down the hill past the Anglican church on your right and into town, where you'll find a few restaurants before climbing the hill out of town. You should also take a detour to the lake. As you come into town, turn right at Cross, left at Wheatly and right again at Point Road. From there, you can walk across the football field if the spirit moves you, to the edge of the lake. In winter, you may see skaters in the "corner" of the lake off to your right, or troops of ATVers filing off the lake. If you walk onto the lake, you get a different view of Sydenham Lake dam to the left — but don't go close to it. There's a healthy amount of open water just before it pours over the dam. This is the start of Millhaven Creek, which flows to Lake Ontario. Back to Wheatly Street, turn right and onto George and you'll be back on the trail. Just over the dam, there's a nice little park overlooking the dam and the IGA. Head over the Cataraqui Trail (the east-west rail bed) and left down Portland Avenue. A short jaunt will get you to Switzer Road, which cuts back and sharply up the escarpment. When it levels out, you'll see a very nice road allowance leading between fields and over a little creek before reaching Alton Road. Head west (left) on Alton for about 350 metres, where you'll see the trail triangle. Go over the style and stay left walking parallel to the road until you come to a driveway at the end of the field. Turn right here and go north a short distance to another style, were you'll jog left and then continue up the hedgerow for just over 150 metres, where the signs will tell you to turn left. Again walk along the fence row here until you must turn right (north). You'll pass a little barn on your right. It's a pretty straight slog for just over 850 metres before you take another style left. Watch that you don't meander into residences at the end of the straight stretch; it can be a little confusing. Just keep a sharp eye out for the style. The trail now crosses a field. Look to your right and you'll see an area where it looks like residents of the houses on your right have bonfires and the like. Across the field and you'll briefly turn right into another road allowance. Again take care not to wander into the back yard of nearby folks. (If you're doing this as a round trip, note this short section of road allowance and when you turned onto it. When you come back, it's easy to keep trucking down length of the allowance.) The trail heads off left into the bush and away from the houses. It may be easier to follow in the summer, but in winter at the points when there are no tracks or too many, you have to keep an eye on the triangles. As noted in the introduction, the triangles can be sporadic at times and sometimes not there when you need them. However, I've found their angles pretty reliable; when it says turn right, believe them! The trail now winds to Freeman Road, where you turn left and take the final 300 metres. The road then dips down the escarpment, but the trail turns right to run along the escarpment edge. I did this section as a round trip. On my way out, north of Alton Road, I lost track of the signs (my fault) and ended "field-whacking" my way back to the trail. It's probably not recommended by cautious trail promoters, but it was a most enjoyable cross-country tour over marshes and through bits of woods — vishwawalking at its best. (Really, I was most considerate of fences, etc. No farmers' properties were damaged in this exercise.) I won't chronicle my route, but if you check your topo, you'll see lots of interesting ways to go. This is an excellent walk that runs for the most part along what is known as the Rideau Lake or Canoe Lake or Desert Lake fault. The Rideau Trail guidebook describes the fault as running "at least 160 km" from Odessa in the south, north to Upper Rideau Lake and further. At Upper Rideau Lake, Foley Mountain Conservation Area is home to (duh!) Foley Mountain, which is part of the fault. A report on the fault from Queen's University in Kingston, describes the Canoe Lake Fault as being "about" 100 km long (see the "En route to Stop Three" section on page 13 of the Queen's report). Whatever its length, it's impressive. The trail is also precarious at the outset. You can follow the blue triangles at this point, which will take you along the flat at the edge of a field. Just a few metres away is the "rugged" version of the trail, which is much more interesting. I was glad to have my expedition poles for this section — sliding down the steep embankment would not be fun. It's mostly an earthy drop, but there are rocky bits that could be nasty if you slipped. In winter (and I imagine in the spring as well) it's slippy and I walked very carefully and was constantly probing with my poles for icy bits ahead. The trail is well marked along this entire section, so it's easy to follow even in winter when the path is less clear. Whether you take the field or the escarpment edge, 600 or 700 metres from Freeman Road, the trail angles downward through hardwood to Knowlton Lake. I walked this section on a dull and snowy day and the lake looked distinctly uninviting. Soon a cottage appeared on the opposite shore and farther along, in the space between a spit and a little island nearer the far shore, were several ice huts. The trail has some ups and downs and judging from a few wet spots, I imagine there could be some problems in the spring. You get some great views of the lake from the edge of the cliff which often drops sharply to the water. Eventually the trail turns to the right (east) away from the lake, just before a road and a cottage appear through the woods. The trail sticks to the woods away from the cottage, then angles in to a road that winds about and crosses other roads for about 350 metres, until it opens onto the straight section, called "Cottage Lane." A further 400 metres and Cottage Lane Meets Gould Lake Road, which comes in from your right and curves around. Follow the signs onto Gould Lake Road. (My electronic topo misnames Gould Lake Road here and indicates that it continues north. However, signs at this intersection clearly indicate the smaller north road as Everett Lane. From here it's an easy 800 metres to the entrance gates of Gould Lake Conservation Area. Rating: , except for short road section, which is . Easy. Note: I have chronicled the main trail here only and noted the Mine Loop and the Ridge Walk on the map, beacuse both run directly run off the main trail. A complete description of these and all the other Gould Lake Conservation Area trails (including maps) is on a page of its own. Along with nearby Frontenac Park, this is one of the best walking areas in southern Ontario, and indeed some of the best trails you'll find anywhere; a trip to Gould Lake won't let you down at any time of the year, although all trails are not accessible in the winter. It's only 8.5 kilometres from one end of the park to the other. However, there are some rugged and steep ridges here, so plan accordingly. It's beautiful and exciting , but it's not a walk in the park... Okay, it is a walk in the park, but sometimes a rugged one. On a hot day, take plenty of water. Once inside the entrance gates to the park, the trail heads slightly to the right, then curves back closely to the road, where you'll find the remains of an old barn. It must have been tough farming this stony ground on the edge of the Canadian Shield. The trail now heads off to the right again, down into a gully and through what the guidebooks calls "a 'cathedral' stand of mature hemlock." It's an impressive section. barn foundation near the Gould Lake Conservation Area entrance. The guidebook also identifies "a white and yellow birch seemingly growing from one root. They don't, however, and grow as twins. Yellow birch was once more prevalent on the shield" (p. 30). We neglected to read the book before walking and missed it but apparently it's there somewhere..
At one point there is a convenient log bridge to carry you over an open stretch of stream. As the trail approaches the marsh to the left of the trail there are a couple of steep stream cuts to negotiate. The trail arches west around the north part of a marsh, then over both the road to Gould Lake and a little side road. After a short stretch through woods, it opens onto a grassy area that was once used for camping. Angle over to the north-east corner to catch the trail. The trail then heads down a slope into the open area near the big barn at the south end of Gould Lake. The trail heads off to the left, but this is is a good place to stop for lunch. If it's buggy, the beach often provides a welcome breeze. You are now 2. 3 kilometres from the gate. log bridge in the first section of the trail inside Gould lake Conservation Area. There are also toilets here and swimming at the aforementioned beach. The park entrance fee is $4.50 a day. The road will take you to the beach and barn at Gould Lake. There is no camping allowed. In winter, you're on the honour system to pay; in summer, students oversee the main gate. A forlorn volleyball net blows in the breeze near the barn at Gould Lake. If you visit the park during school term, you are likely to be sharing it with school kids; this is a popular park for Kingston and area schools and I've found the parking lot filled with schools buses in the winter and spring. On one winter trip I met some high school students and their teachers on the trail and walked with them for a short stretch. They'd just had lunch and had build a tiny fire. The teachers showed then how to build a safe fire and how to eliminate any traces of it when they left. I have chronicled the Gould Lake trails (the Rideau "side trails") elsewhere; however, check out the side trails (the blue triangled trails) on the west side of Gould Lake — the Mine Loop and the Ridge Trail — as you can use these to make good loop trails if you are doing this section in bits. The trails of Gould Lake, as I've mentioned, are sometimes steep and wind through rough bush; that's what makes them such brilliant walks. However, I'll chronicle the next section failrly closely to give you an idea of the terrain. After the mica mine, the area to the left becomes increasingly swampy until you meet open water at the Marion Webb Boardwalk ( which is actually a little bridge, rebuilt in 2008 after broken beaver dams caused a washout of the original bridge). After the bridge, the trail narrows and a bit of gravel has been put down to make the path at the north end of the bridge less wet. marshy section, sporting a bridge railing. Following this there is a little boardwalk/bridge with a rope railing (luxury!) that leads you to another steep incline. Then you drop down again into a very marshy area and skirt to the left until the trail leads across an old beaver dam that will get you across the marsh. Following that, there's a steep incline up a ridge that leads to quite a stretch of grassy "plain." The deer flies were fierce here in mid-July, but it's a nice open section that stays with the trail more or less until it drops into woods again and reaches Brook Junction, just over two kilometres from the Gould Lake beach. There is, as you would expect a little brook here, running down into Gould Lake. When I visited it in early June, it was bubbling merrily; it had dried up considerably when I visited it in mid-July, despite wet weather. That's a fairly detailed up-and-down-description. I'll back off now, but I hope it gives you an idea of the ups and downs involved in the Gould Lake trails. 2) take the lower main trail by Gould Lake to Bedford Road or loop back to the beach via the Ridgewalk. Taking the main trail right (east) down the hill by the little stream, you'll have to negotiate the stream and a wet area as you near the lake and curve northwards again. The little creek, seen here just below Brook Junction. It runs into Gould Lake. You'll get lots of opportunities to view a finger of Gould Lake here. There are some nice sloping rocky bits of shoreline with little grassy or mossy bits where you could spend an afternoon lunching and snoozing. At the finger's end, there's a beautiful spot for picnicking. It's open, with a great view and a refreshing breeze. There are stone cairns for trail markers at points here as the trail winds slowly back from the lake to a pond on the left and a beaver dam. and creek. It's worth checking out the six mica mine holes here, between the pond and the lake. They sit, west-facing in a line. Be careful: if you're alone (as I often am), falling into one of these could be deadly. The trail follows a short but narrow ridge here and you get a great view of the lake and its islands. Then, as the path drops to water's edge again, it follows a narrow hump of land right at the shore (it looks like an out-of-place old beaver dam) between marshland and the lake. It then sticks close to the lake until it curves in slightly to meet the Ridgewalk again at it's northern Junction. Then it's over a creek and up a steep hill to a bench that overlooks the lake, placed there in memory of H.A. (Harry) Dyer. There are a few cottages on the other side of the lake (and, indeed a few below you on the west shore). It's one or more of these landowners that presumably forced the redirection of the trail to move farther to the west. Never mind, the view is spectacular and the breeze is refreshing especially if the bugs have been bothering you in the bush. The next section is a great up and down twist through and around swampy areas. Be prepared to negotiate hills and ridges along the whole stretch. At one point, there are yellow tin-can lids nailed to trees below the markers. As you get nearer Bedford Road, similar tin-can lids, this time painted blue are nailed to trees for a section. I have no idea what their significance is. The swamps turn to open water at points and you get great views of tracts of water with various shorelines: rocky cliffs, reeds, semi-open sections and so on. As you come down the hill to the cabin, make a sharp left around the pond. Farther on, you'll have to negotiate a beaver dam in a shallow dip. 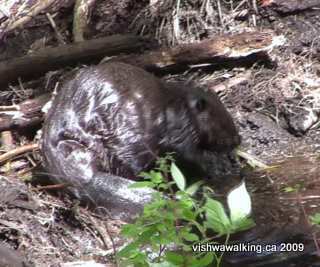 I thought the dam was abandoned and partially wrecked, but a beaver appeared and I spent a good half hour watching him/her build up his/her dam. The trail parallels the road for a short bit. Just before you meet the road, you'll negotiate one last section of wet area at the end of a marsh and small pond. This bit could be tricky in the spring and I can imagine more than one person has bushwhacked to the road from here. However, in early June, with some careful log-hopping, it was fine. Then it's through a bit of softwood, then a hardwood section of wood to a fence by the road. The trail meets Bedford Road on the right-hand side 830 metres to the north of Salmon Lake Road (the road to Frontenac Park). The road dips (there's a swamp on your right) then rises again. As the hill alsmost crests,watch closely for the horizontal pole attached to a fence pole and an outcropping of rock immediately to the north of the spot. Walk south (down the hill) past the swamp. The trail curves slightly as it rises again. Turn left into Salmon Lake Road. (in June, 2009), which may make it more confusing to find. Salmon lake Road winds a bit, passing Elbow Lake (that's what it's widely known as locally, but it is shown as Pearkes Lake on most maps), then passes between South and North Otter lakes. There are roads shooting off the main road, but your route to the trail centre in Frontenac Provincial park is clear. The folks in the trail centre are incredibly friendly and will give you all sorts of information, including maps, if you ask. an easy place to launch a canoe. It's officially $2 for a day walk-in permit. I'll note car and camping fees when I describe the park section of the Rideau trail. After the high of the Gould lake Conservation area, this last section is pretty mundane. But then, there's Frontenac Park to look forward to. How to get there: See the previous page (K&P Trail to Sydenham) for directions from Kingston to Sydenham. Follow the Gould Lake Conservation Park instructions to get to that park. Frontenac Park is farther north on Bedford Road. Turn right at Salmon Lake Road to get to the park's parking lot.